MORNING CARLINE PROCEDURES: Please review the linked document below carefully as we will now have Blue Line and Red Line Traffic. Blue Line: PK-1st - Families with (PK-1st) students will utilize Blue Line Traffic Pattern. McAllister staff will open the doors of the cars for these students. If you have a mixed group of students, please utilize this line if there is a PK-1st grader in the car. 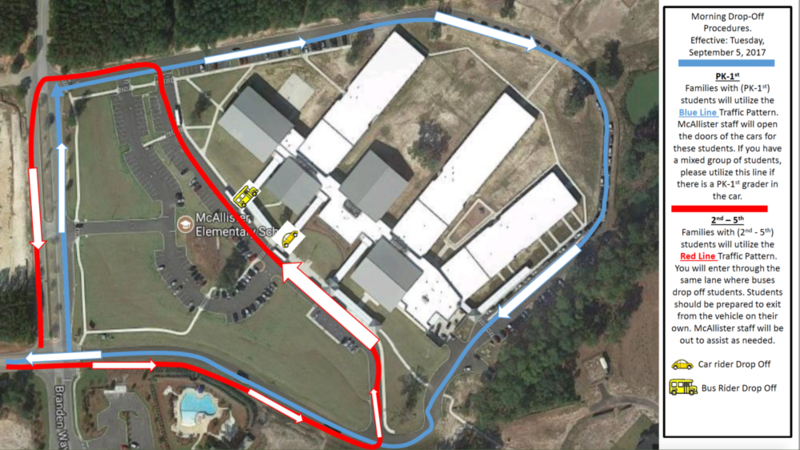 Red Line: 2nd-5th - Families with (2nd-5th) students will utilize the Red Line Traffic Pattern. You will enter through the same lane where buses drop off students. Students should be prepared to exit from the vehicle on their own. McAllister staff will be out to assist as needed.